Getting weekly produce boxes has given such inspiration to step out and try new things. We had persimmons in this last box. 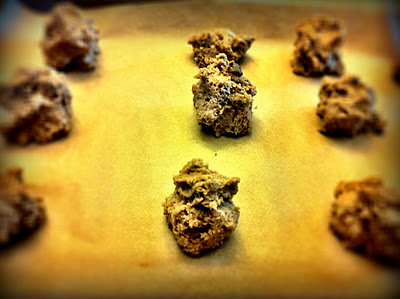 I've heard they make good cookies, so I thought I'd give them a try, gluten-free style. 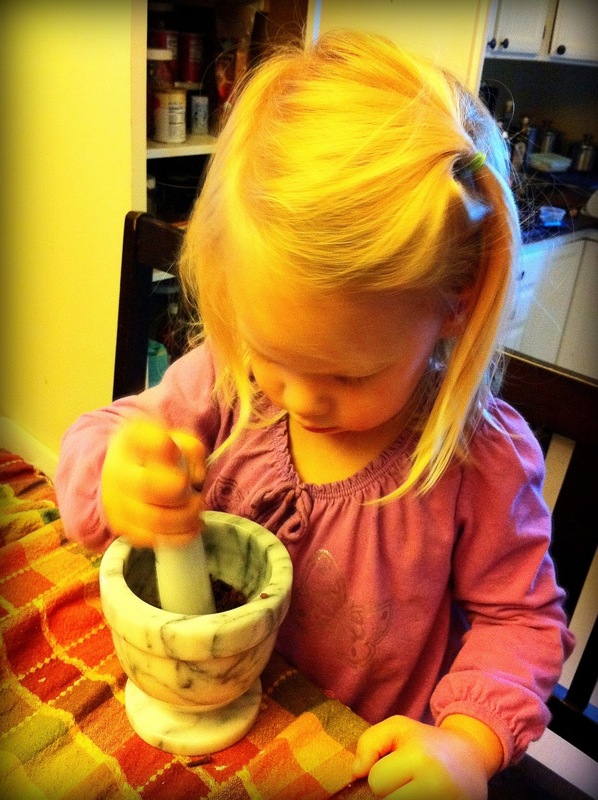 I've also found great value in the pestle and mortar. Not only is it lovely using freshly-powdered spices, it's a great job for little kitchen helpers (and a wonderful sensory experience). 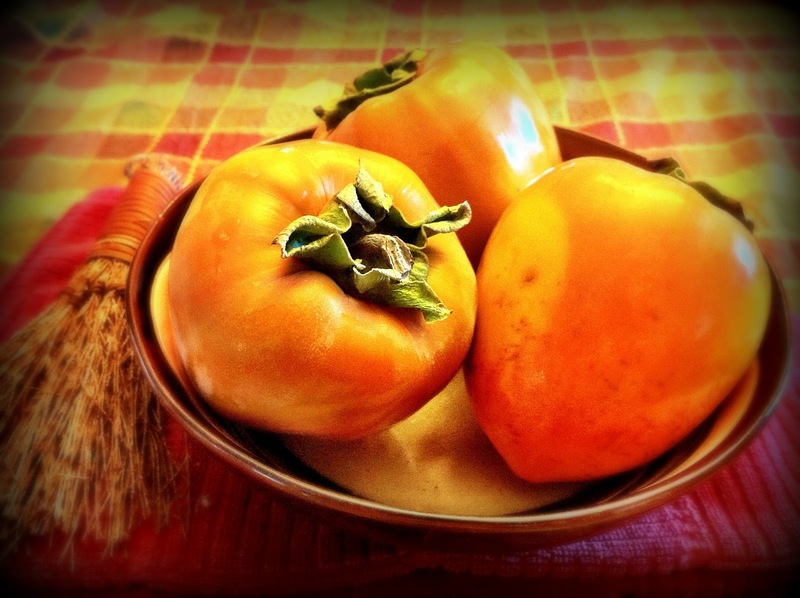 Puréeing the persimmons is quite simple. If you have a high-speed blender like a Vita-Mix, there's no need to peel it. Just cut off the tops and cut it into about six pieces. Run it through the blender until smooth. If you're using a different blender or food processor, you'll also want to peel it first. Also, make sure your cookie dough balls are kinda tall because they spread. In a mixer blend flour, soda, salt, and spices. In a large glass measuring cup or a bowl, whisk together purée, syrup, oil, egg, and vanilla. Pour liquid mixture into dry mixture and beat for about 30 seconds. Turn the mixer to low and add pecans and raisins. Spoon batter onto 2 baking sheets. 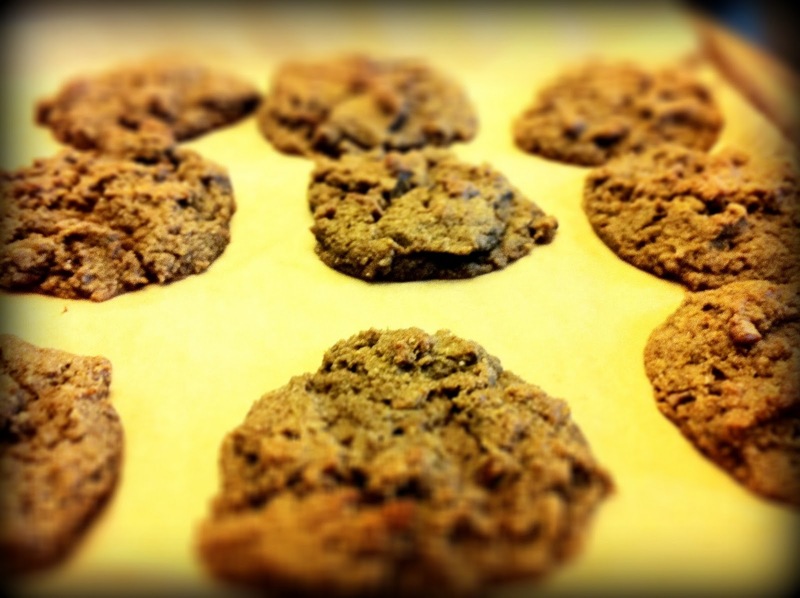 If they're not stoneware, grease baking sheets or lay parchment paper onto the sheets. Leave plenty of room in between cookies, they spread. Bake 16-20 minutes. Allow to sit on sheets for about 20 minutes, then serve warm. Store in an airtight container. I'm sharing this at Monday Mania, Barn Hop, Traditional Tuesdays, Real Food Wednesdays, Frugal Ways, Sustainable Days, Pennywise Platter, Fresh Bites Friday, Fight Back Friday, Farm House Friday. We are quite partial to Middle Eastern cooking around here. Never heard of baba ghanoush? Consider this your lucky day. It's basically eggplant hummus. Eggplants are full of vitamin K, Thiamin, B6, Folate, Potassium, Manganese, and fiber. I had three eggplants in this week's produce box, so we made three batches (one to eat now, two for the freezer). 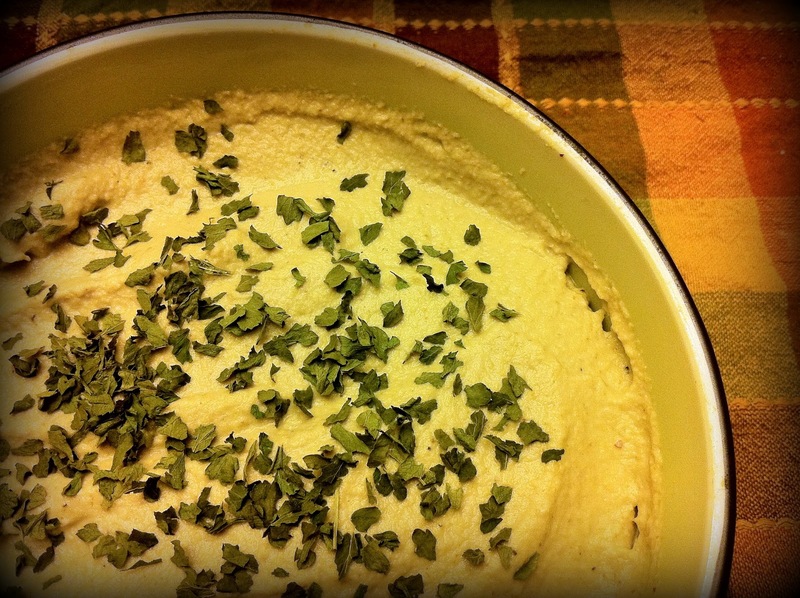 This gluten-free dip is a great hummus replacement for those on the GAPS diet because there are no beans involved. 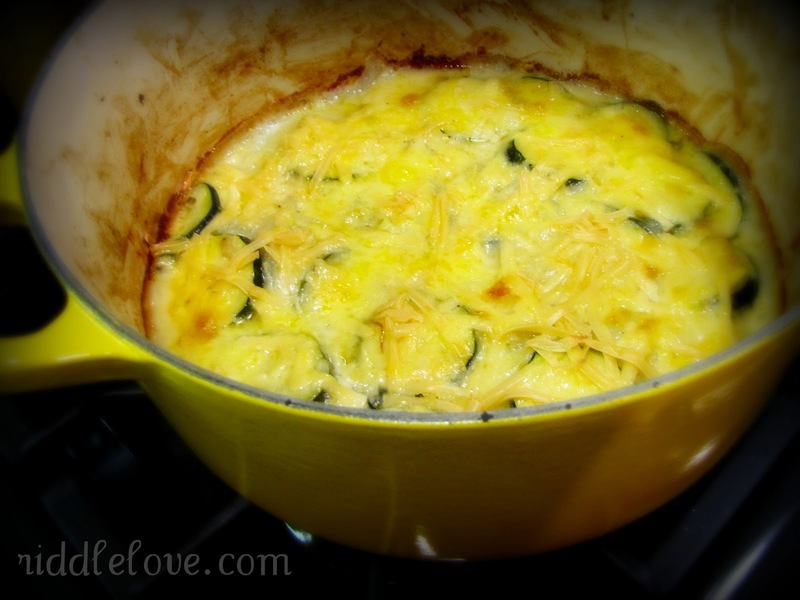 Here is our super-de-duper quick recipe. Disclaimer: it takes 3 minutes to make once you've roasted the eggplant. The three minutes does include peeling the eggplant, so I don't think I'm steering ya wrong with the title. To roast the eggplant, simply heat the oven to 400º, prick it with a fork in a few places, and bake for 30-40 minutes. Let the eggplant cool before peeling, which is a breeze. I just peeled the skin off with my fingers. Peel eggplant and cut into 6 equal pieces. Put in blender (a high-speed one like a Vita-Mix will yield the smoothest results) and add remaining ingredients. turn blender to low, then gradually move to high and blend for about 15 seconds. Put in serving bowl, sprinkle with fresh or dried parsley. 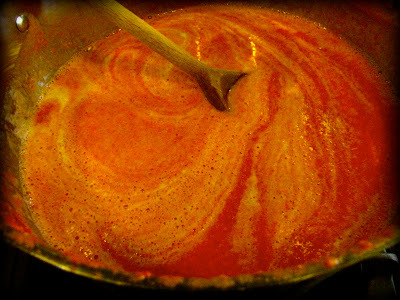 Chill for at least 3 hours before serving to allow the flavors to blend. Serve with slices of fresh veggies, pita bread or naan, or use it as a spread in sandwiches. I'm sharing this at Monday Mania, Traditional Tuesday, Real Food Wednesday, Simple Lives Thursday, Pennywise Platter, Farm Girl Friday, Fresh Bites Friday, Fight Back Friday. Over the weekend, we spent a day at the local historical family farm. Every October, they pull out all the stops for every pumpkin hunter. We look forward to visiting every year. 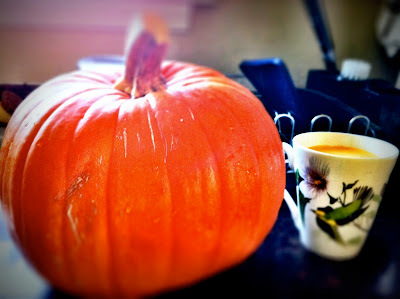 and placed the day's findings by our front door, waiting to be made into all things pumpkin. Do you see that one on the front? That one's mine. Today, we learned that it's kind is called Jarrahdale. They are said to make good pumpkin pie, so naturally that's the one I looked for. They seem to be very similar to my beloved kabocha, and I very much look forward to comparing the two. How do you end a day at the pumpkin patch? By going home and baking a pie, of course. Our favorite recipe is found in Nourishing Traditions (topped with raw whipped cream). 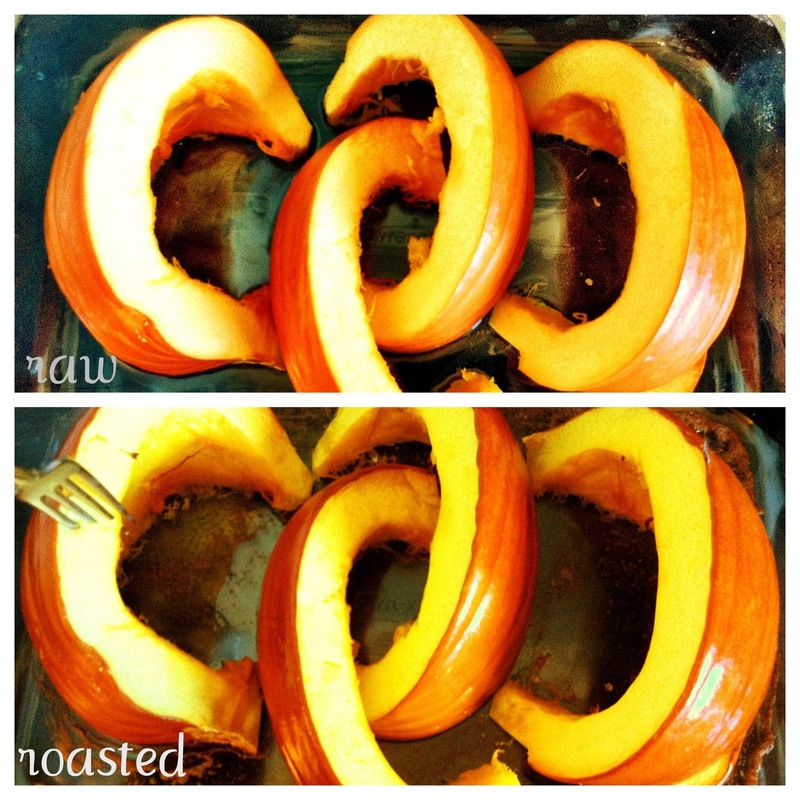 How do you process a pumpkin? Well I'm glad you asked. I wrote about it just last week. Autumn has come, and with it, it's lovely rhythm. I find myself stepping to it's beat as an urge to collect and preserve all I can delights my days. They are filled with smells of cinnamon, nutmeg, ginger, and cloves. We pack up the summer clothes and unearth the cozy ones. It's a time of jolly preparation and anticipation. I do so love this season. My husband has been gone a lot. The kids have been just plain hard to homeschool. I'm a pregnant, emotional ball of energy-less discomfort. The other day, I lost it. I felt like all my efforts in life were for nothing. Father God, Jesus, Holy Spirit, help me. I'm in a bad way. I looked up and out. I looked down and in. He is everything good that comes out of me. He is the Strength and Grace that guides me through seasons like living in a fifth-weel as a family of six for eight months. 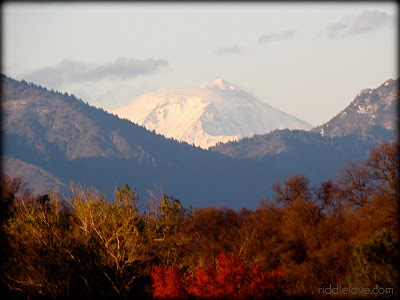 He is the reason that takes my breath away every time I watch our babies sleep, look up to the towering mountains, witness dead winter transform into spring that bursts with life. He is the love that brought a dear friend over that night, with dinner and a kind, listening ear. He is the One who gives the energy and life that sustains me. He extends His invitation of unconditional love and affection to every human being. He overwhelms me with His goodness. First of all, turn on some music and light a fall-ish candle or two. Make it a special seasonal moment. (Before you know it, it'll turn into a yearly tradition.) My playlist includes Turkey in the Straw, bluegrass-style. There's the word "pumpkin" in it, and I like themes. It streamlines my brain, I think. 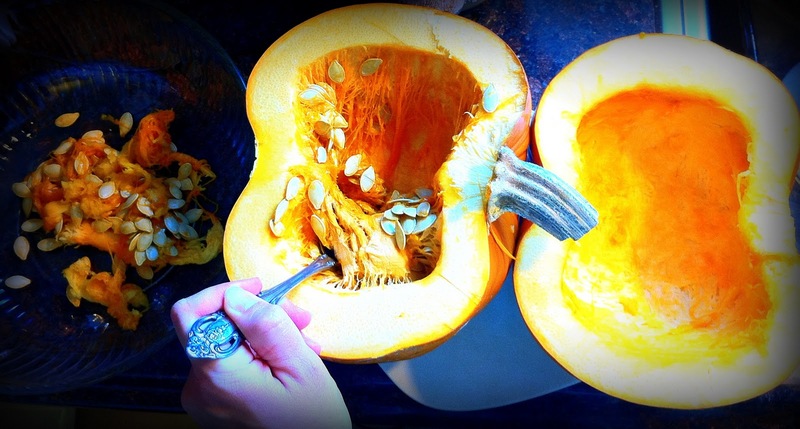 Now, most recipes will tell you to use those cute lil' pie pumpkins. They can sometimes have a darker color, and some say they're sweeter, but let's be honest. Pretty much everything we make with pumpkin is sweetened, right? This time around, I'm using a ten pounder and I've had great success with these beasts. There are two ways I like to roast the meat, but let's not get ahead of ourselves, shall we? Cut your pumpkin in half. If it's a biggun like mine, cut each half into a few wedges or even into fourths. 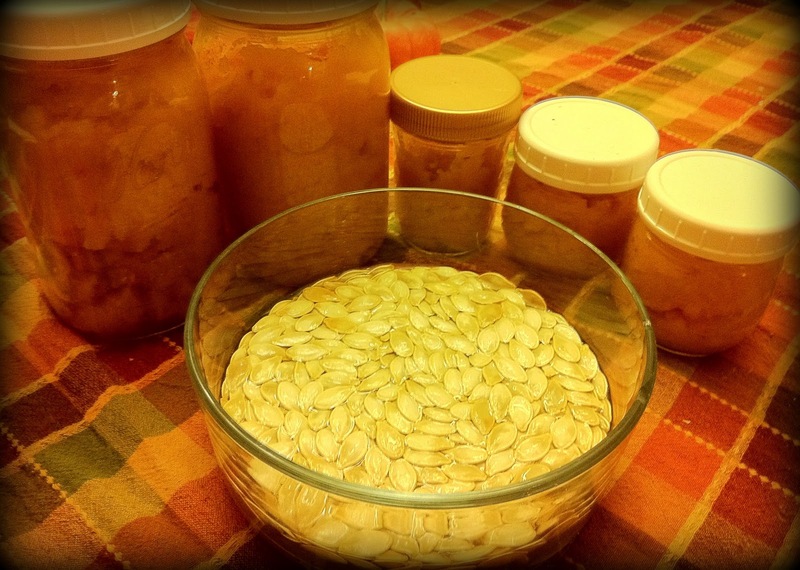 Scrape the seeds and stringy guts out with a spoon and put them in a bowl. Let's just keep them there for a minute. We'll come back to you, lovely pepitas. Use the biggest glass pan you have (you may even need to use two), put about a cup of filtered water in the pan, place pumpkins flesh-down in the pan, and roast for about 1 hour or until you can stick a fork in it (hence the "fork" saying). Allow to cool, then scoop flesh out with a spoon into a food processor and pulse a few times to purée. You'll need to do this in a few batches. Over-stuffing the food processor leads to liquifying the bottom half and leaving a chunky top half. Store in glass mason jars. It freezes well (though I'd like to can it one of these days; my freezer is about to erupt with bulk-bought grass-fed beef, bone broth, and berries). 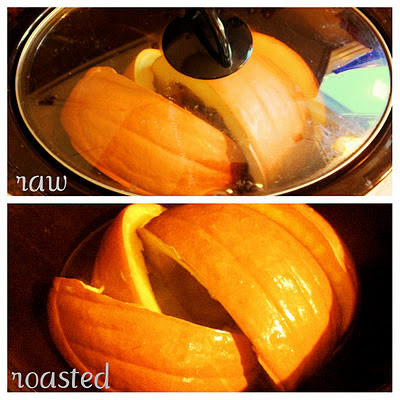 Turn slow cooker on high, add a little water, stuff pumpkin slices in, and cook for about 4 hours. The oven. 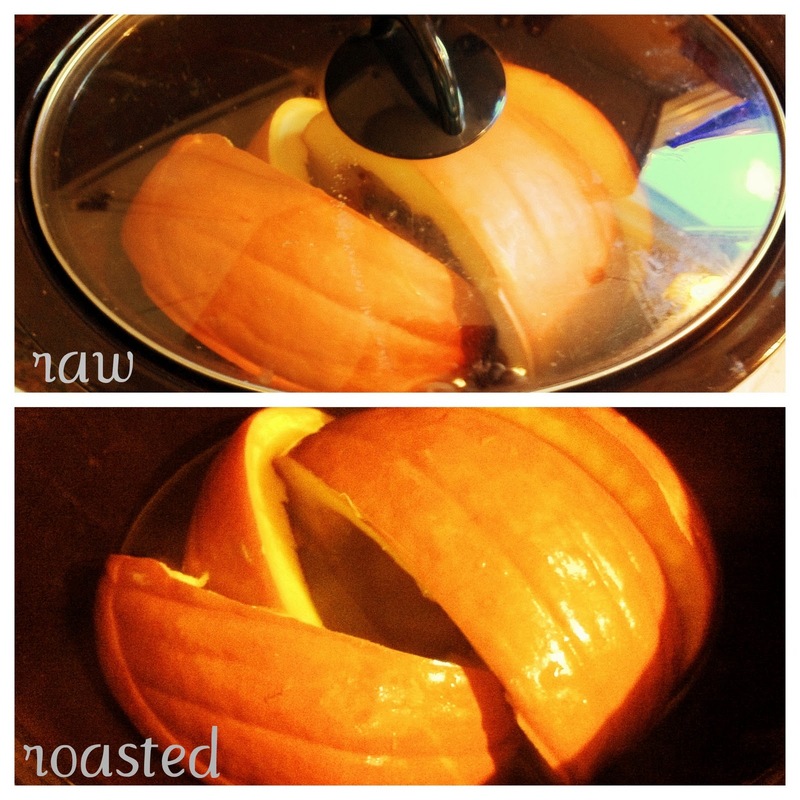 It's faster and the pumpkin isn't as watery once it's cooked. First, squeeze the seeds out of the membranes and into a colander (see pictures above). I know that sounds gross, but it's really not. I promise. It's actually kinda therapeutic if you ask me. 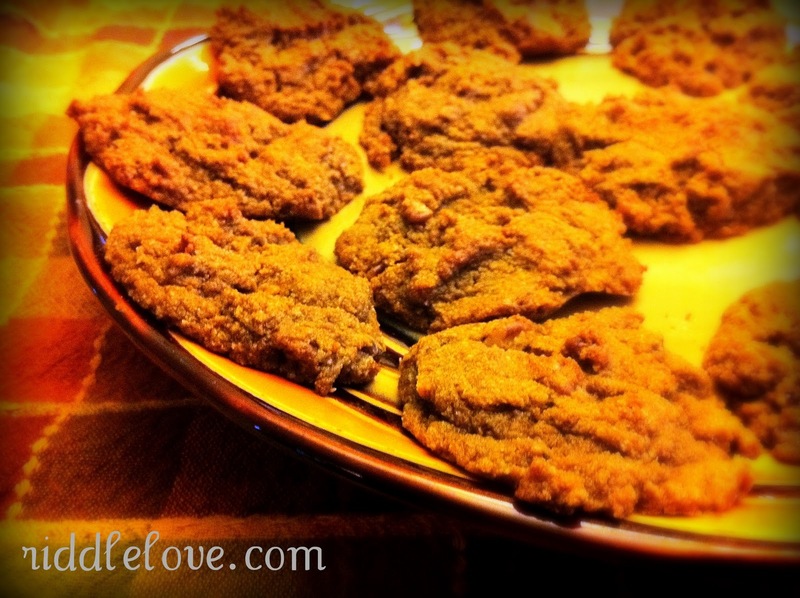 Treat the chickens to the gooey stuff. If you don't have chickens (I'm sorry), compost it along with the pumpkin skin and you'll give the earth a treat. 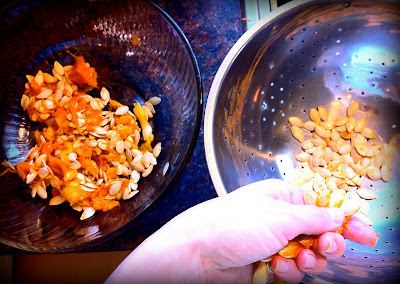 Rinse the pepitas. Here's the deal. 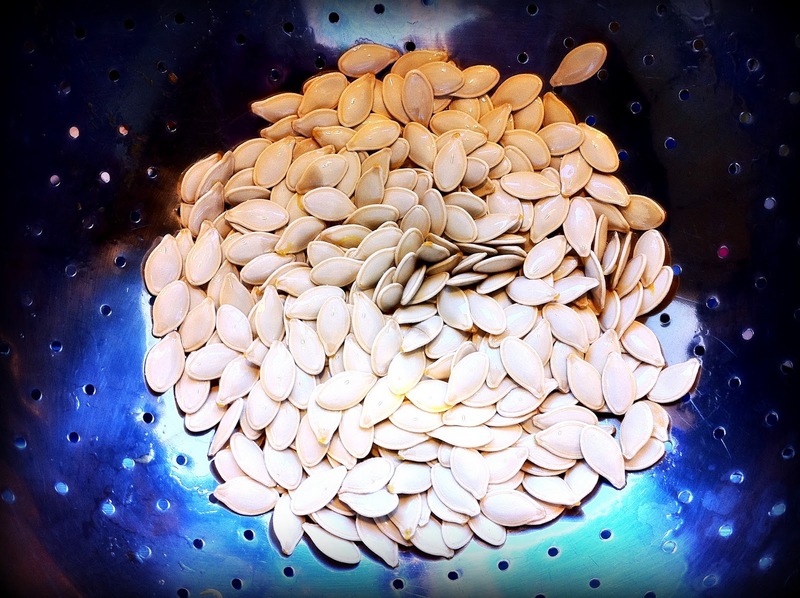 I tried hulling a batch, thinking my family would appreciate them more, but I came to find out that they actually look forward to the salty, whole pepitas every year. Well that is just fine with me. Besides, I didn't have a good experience trying to hull them (I used this method). Please let me know if you've had success with this operation. I'd love to hear some tips. The Riddle household pepita of choice is simply soaking them in a brine of water and about a tablespoon of Celtic sea salt overnight, draining them (don't rinse them), and then dehydrating them at 104º until crispy. You can add seasoning to the brine if you'd like, like garlic powder, parsley flakes, onion powder, etc. But my family is full of purists when it comes this, so I stick with just the salt. I'm sharing this at Barn Hop, Traditional Tuesday, Real Food Wednesday,Simple Lives Thursday,Pennywise Platter, Fresh Bites Friday, Fight Back Friday, Farm Girl Friday. With ranch as our favorite salad dressing, it's a wonder this recipe hasn't shown up here until now. In all honesty, it's taken me this long to veer away from using (organic) seasoning packets to making it 100% raw and from scratch. Not only does this dressing contain wince-free ingredients such as essential, nourishing fats to help your body absorb the valuable nutrients from the salad, it's packed full of probiotics to help aid digestion, strengthen immunity, and give it that tongue-dancing tang. Let's not forget to mention the many benefits of raw apple cider vinegar, Celtic sea salt, and immune-boosting fresh garlic. I don't know why I was so gun-shy about making this dressing, it really only takes five minutes to assemble and those lovely probiotics allow this ranch to last a couple of weeks in the fridge (if you don't run out of it first). 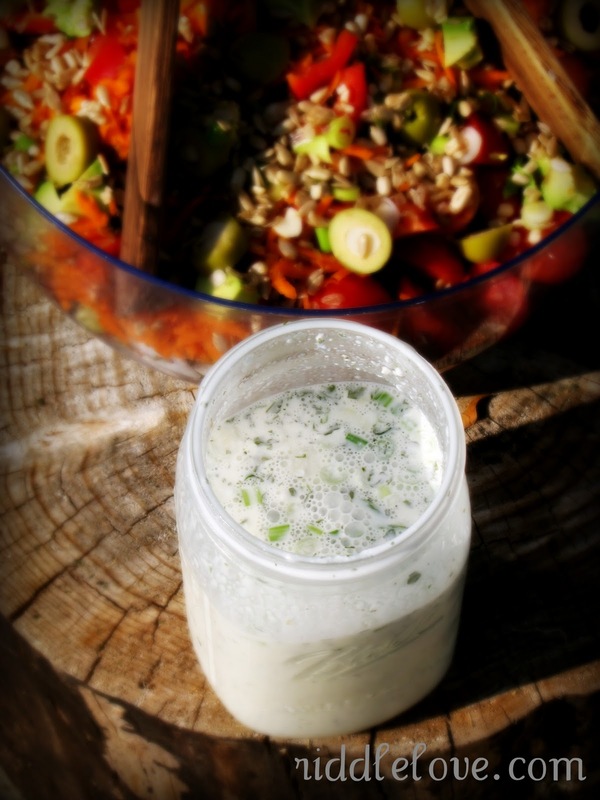 Place all ingredients in a quart-sized mason jar, screw the lid on, and shake until combined. 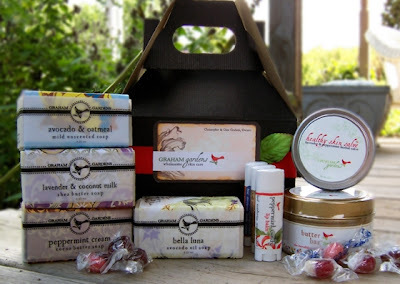 I"m sharing this at Barn Hop, Monday Mania, Traditional Tuesday, Real Food Wednesday, Simple Lives Thursday, Pennywise Platter, Fresh Bites Friday, & Fight Back Friday. After making countless batches of delicious, fresh salsa and storing up jars of homemade ketchup, what else to do with the last of these jewels of summer? Now that the days are shorter and the nights are deliciously crisp, how about a nice, comforting bowl of creamy tomato bisque (a.k.a. Jeremy's all-time favorite soup)? Pair it with a buttery, sourdough drilled cheese sandwich, yes? Let's do this thing. and it added up to about 8 cups whole & puréed. The scent of sautéing the aromatic veggies in that bacon grease is some kinda wonderful, I tell you. It's nice how the pot tells you the soup has reduced by the ring above, don't you think? So. 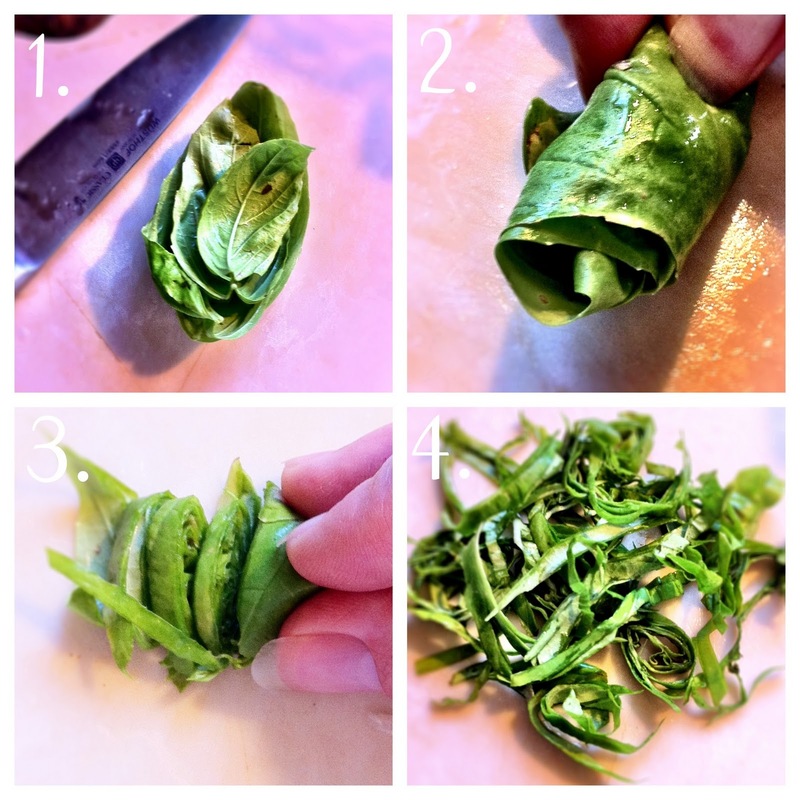 Chiffonade basil. Such a fancy name for a simple technique. Here's what ya do: roll the fresh basil leaves up and slice them thinly. The end. 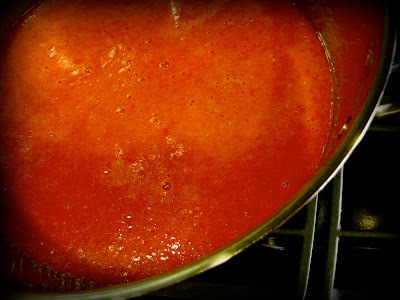 Purée tomatoes in blender (a high-speed like a Vita-Mix is best) until thoroughly blended. 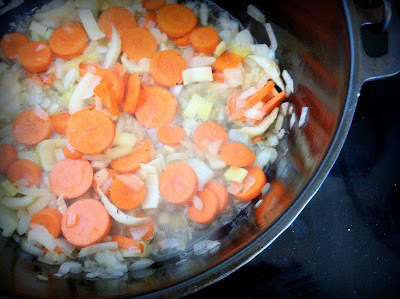 Heat soup pot with bacon grease until melted and add onion, carrot, and celery. Sauté until the onions are translucent. Briefly whisk in arrowroot powder/water mixture. 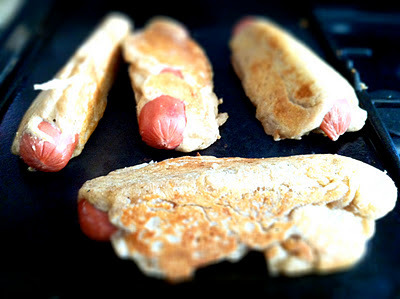 It might become gelatinous but it will thin out as you continue with the recipe. 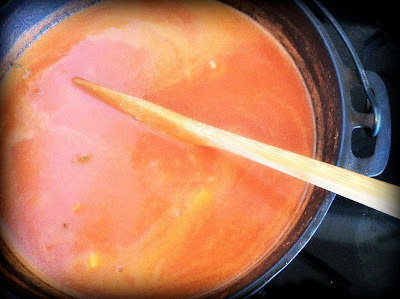 Add stock and puréed tomatoes and continue to whisk until it's brought to a boil. Turn heat to medium-low and add thyme sprigs, red pepper flakes, and pepper. Keep the top open and allow soup to reduce to about 1/3 (about 45 minutes to 1 hour), stirring occasionally. Turn off heat and compost thyme sprigs. If you don't mind your soup a little lumpy, add remaining ingredients, run an emersion blender through it, and you're good to go. 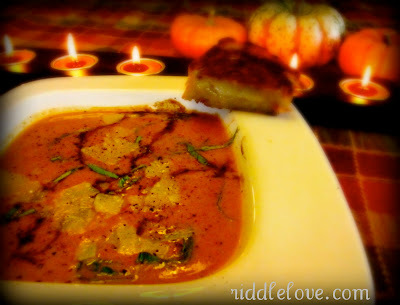 If you're like my husband and enjoy the bisque as smooth as possible, you may also want to pour it through a sieve, composting any chunks. I'm sharing this at Monday Mania, Barn Hop, Traditional Tuesday, Fight Back Friday, Fresh Bites Friday & Pennywise Platter. This apron was made by my grandma; a person in history I always wanted but never had the chance to meet. She passed away when my mom was only sixteen. This apron doesn't fit me by a long shot. Grandma was a good six inches shorter than me. I wear it anyway. I feel connected in it. Connected to my grandma, who could look at any dress, outfit, or apron and knew how to go home and make it (what is that like?!). Connected to my mom who can do the same thing with any recipe (and can make it better, if you ask me). This apron connects me to a line of homemakers, each with her own strengths in this fine art. In this apron, I am weaved into a line of mothers. Each one parented as best as she knew how. I look down at this growing baby belly, protected by this apron from cooking stains, and pray that I may raise all five babies, born and yet to be born, in the unique way each one needs to be nurtured. What a humbling privilege this is. The colors and pattern of this apron are so cheery. I treasure the unique vintageness it brings to my kitchen. This apron is a symbol of heritage preserved throughout three generations. It wouldn't have been possible for me to enjoy dawning it every morning had my mom not taken care of it so well. It makes me wonder what I'm doing (or could be doing) to preserve and pass down the richness that has been gifted to me. It stands for so much, this apron of mine. I'm sharing this at Farm Girl Friday, Simple Lives Thursday, Barn Hop & Gratituesday. Ketchup, catsup... however you spell it, my kids adore it. The fact that I'm even messing with this sacred food (yes food, not condiment) of theirs is quite risky. I've tried three recipes. One was "too spicy," one was "too lacto-fermenty," they weren't puréed enough... I'm competing with Trader Joe's organic ketchup here. You'd think a homemade version would be a definite upgrade, but not according to my kids. Since I haven't been able to exactly replicate their ketchup, I resigned to calling this homemade version (this recipe is as close as I could get to Trader's) "red sauce" or "red dip." Whichever name will most delight the eater is the name I use. 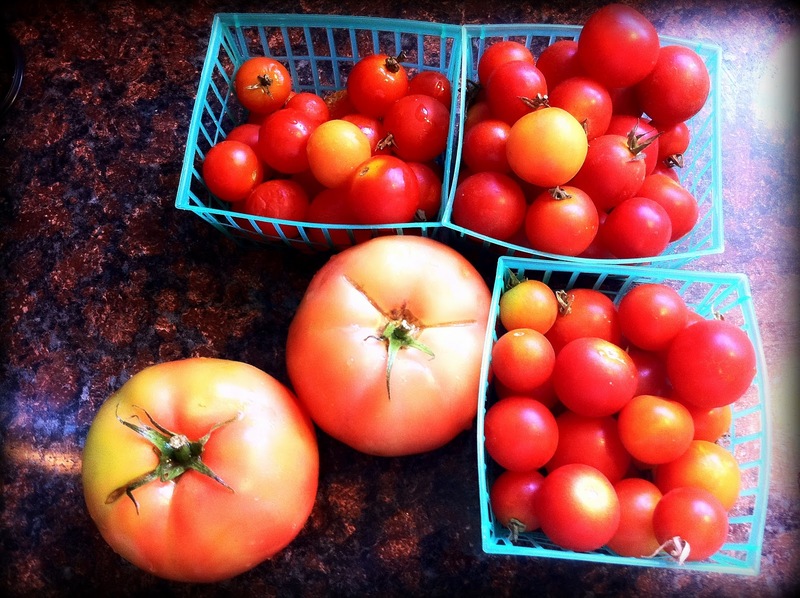 We received a lot of red tomatoes in our CSA box this week, and we go through ketchup faster than fresh tomatoes, thus this the birth of this recipe. I broke three standard rules for ketchup-making: I didn't use Roma tomatoes, nor did I peel or seed them. Why? Because I was using the tomatoes I had on hand and to save time. It worked just fine. So there, standard ketchup. Can it, ferment it, eat it fresh, it's up to you. 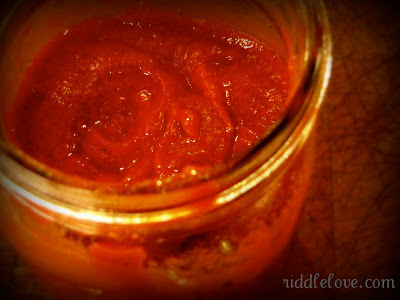 I'll show you how to preserve this "red sauce" two different ways at the bottom of the recipe. 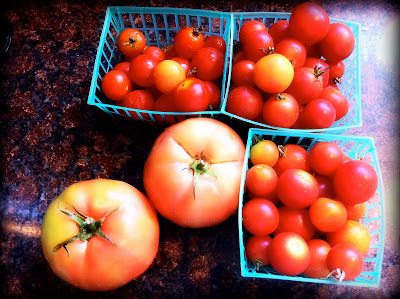 Start off with nine ripe tomatoes of your choice (freedom ketchup!). Quarter and run them through a blender. A high-speed one will give you the smoothest results (I use a Vita-Mix). It took two batches of blending for me. 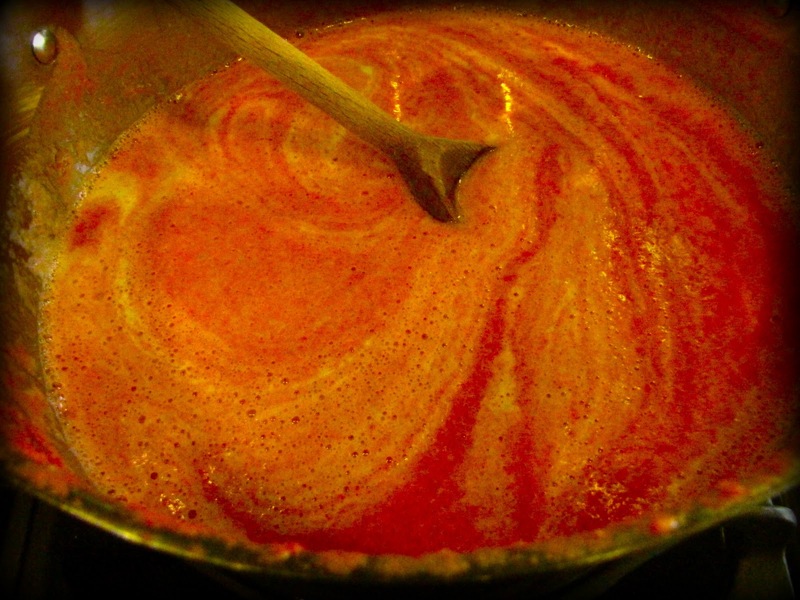 Then, dump the purée in a large saucepan or even a stock pot. Blend the onion and pepper and add those to the pot (or, if there's room, blend the onions and peppers with the tomatoes to save time). 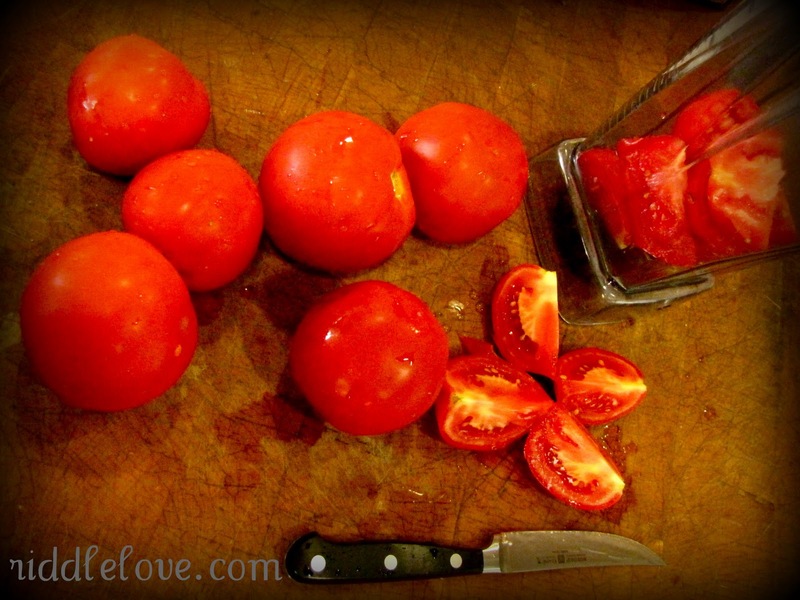 9 medium to large ripe ORGANIC tomatoes of your choice, quartered Please note: if you're using chemically-treated tomatoes, you will need to blanch, peel, and seed your tomatoes first. 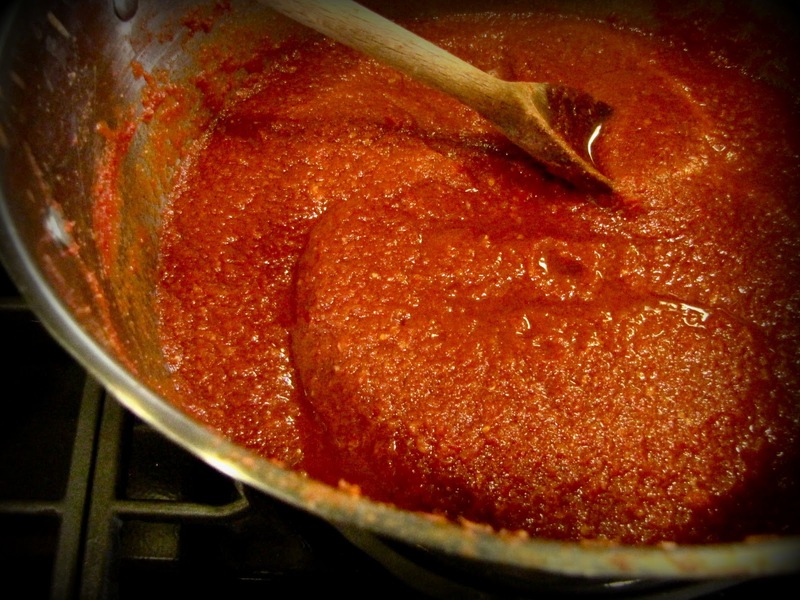 Blend tomatoes, peppers, and onion (preferably through a high-speed blender). This might need to happen in two or more batches. Pour in a large saucepan or stock pot and bring to a rapid boil. Allow purée to reduce to about half, stirring often. Turn heat to medium and add remaining ingredients. Cover and check periodically to see if it's reached your desired consistency. This can take 1-4 hours depending on how thick you'd like your ketchup to be. Store in fridge or double the recipe if you'd like to preserve some. Decrease vinegar to 2 tablespoons and add 1/4 cup whey (not the powdered kind) to the end, cooled product. Stir and leave at least 1 inch of space between the ketchup and the top of the jar. Cover and sit on the countertop for three days, then store in the fridge (or a root cellar if you're blessed enough to have one). Do you have a favorite ketchup recipe? Are there certain seasonings you simply can't do without in yours? I'd love to hear about it if you do. Happy ketchup-making! I'm sharing this at Barn Hop, Monday Mania, Traditional Tuesday, Real Food Wednesday, Pennywise Platter, Fresh Bites Friday, Fight Back Friday, & Simple Lives Thursday.